Come and join us for our Family Fun Day at Gibside this Sunday! We'll be celebrating all things Red Kite between 10am and 4pm. And more! You'll also have the chance to meet the Friends of Red Kites group to learn about these rare birds. Fingers crossed, you might even see a red kite flying overhead while you're there! 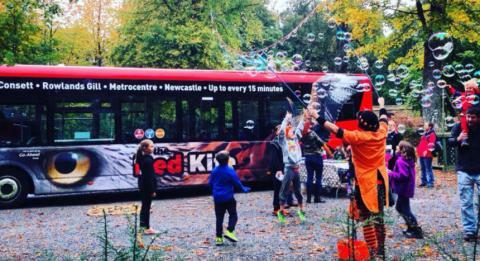 Get yourself along and join in the fun – it's easy to get there on our Red Kite buses. Buy a Family Day Ticket for just £10! Available to purchase on the bus from the driver or on the Go North East app. Covers up to two adults and three children under 16, with a minimum of one adult and one child required at any time.